My VMware's "You either are not entitled or do not have permissions to download this product." error, and what to do about it. "You either are not entitled or do not have permissions to download this product." Why is this? 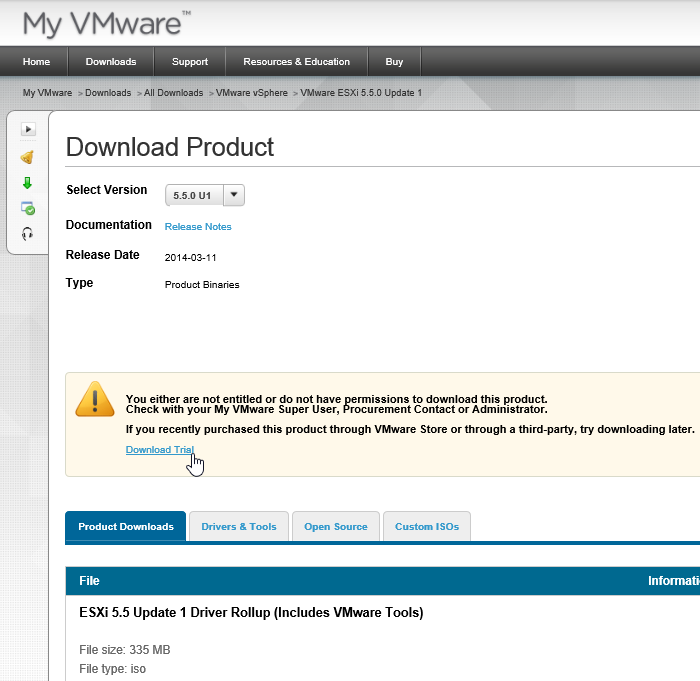 Is there a way for anybody to be able to download the preferred VMware-ESXi-5.5U1-RollupISO.iso version? Any and all help appreciated. Thank you! Thank you for contacting VMware Support. My name is REMOVED and I am from My VMware Portals Team; I will work with you to resolve this issue through the support request REMOVED. I understand that vSphere binaries are still available for you to download despite the expiration of evaluation period. Rollup file is only available for download with a valid license key. This is a portal defect and we will have to enable the download restriction. Please find the attached screenshot for more clarity. While I will be the primary owner of this support request, this issue needs involvement from some of the other internal groups within VMware. I will work with the groups internally and provide you status updates periodically till we resolve the issue. I will provide you with an approximate time frame to resolve this issue within the next 24 business hours. I look forward to working with you and thank you for your patience. I do appreciate your quick answer to this question, and I'd be interested in helping any way I can, in case you have further questions. Stop back again later, I'll update this article as the saga unfolds. But yes, there does seem to be some security and download issues here. Not a big deal, since it's the licensing keys that matter. This isn't some big security exposure or anything. Also note that VMware can likely "see" from the HashKey in the long URL exactly which authenticated user is sharing their URL inappropriately. Finally, I'm not naive enough to think that one support person speaks on behalf of VMware, which is why I've removed his name. This is a longstanding issue. Which is another reason why I'm being open about reporting this, publicly, to avoid duplication of effort. It'll likely take some time for these issues to be resolved, I suspect. If you're curious how the download of VMware-ESXi-5.5U1-RollupISO.iso is supposed to look, without the entitlement error, view the original video here, which I've replaced with the simpler, applicable-to-everybody video here. So instead of "access for all" to the admittedly only slightly improved ISO that already has some newer drivers injected, I'm rewarded for reporting this barrier to entry for newbies by getting my own personal account more locked down. Hmm. Remember, newer drivers could help newbies avoid workarounds to get past a shrinking list of hardware supported in the base ISO. Does it make sense to scare more folks away? While much of TinkerTry has been about smoothing over those potholes, helping hundreds of thousands of site visitors read about building a lab in about an hour, I'd still rather it be plain easier for everybody to get started. Driver support, coupled with licensing confusion, have frankly been my least favorite topics to try to explain to my wonderfully polite TinkerTry commenters. Why? Because at heart, I'd rather be "playing" with the code in my home lab, the way I learn fastest, and most effectively. I suspect some of you feel the same way about your home labs. Perhaps VMware really is headed back toward something like VMware Go, as VIRTXPERT Jonathan Frappier theorized back in January 2014 here. Yes, my thoughts here all all just conjecture and opinion, but I suspect others share some of the same thoughts and feelings. Download ESXi 5.5 Update 1 and the other vSphere pieces to get your home lab started by Paul Braren at TinkerTry on Mar 12 2014.